Wills offer many benefits and are an important part of any estate plan, regardless of how much property you have. Your will can ensure that after death your property will be given to the loved ones you designate. If you have children, a will is necessary to designate a guardian for them. Without a will, the courts and probate laws will decide who inherits your property and who cares for your children. But there are certain things a will cannot accomplish. 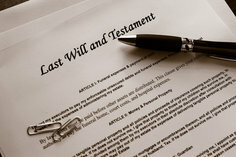 A will has no effect on the distribution of certain types of property after your death. For example, if you own property in joint tenancy with another co-owner, your share of that property will automatically belong to the surviving joint tenant. Any contrary will provision would only be effective if all joint tenants died at the same time. If you have named a beneficiary on your life insurance policy, those proceeds will not be subject to the terms of a will and will pass directly to your named beneficiary. Similarly, if you have named a beneficiary on your retirement accounts, including pension plans, individual retirement accounts (IRAs), 401(k) or 403(b) retirement plans, the money will be distributed directly to that named beneficiary when you pass on, regardless of any will provisions. Brokerage accounts, including stocks and bonds, in which you have named a transfer-on-death (TOD) beneficiary will be transferred directly to the named beneficiary. Vehicles may also be titled with a TOD beneficiary, and would therefore transfer to your beneficiary, regardless of any provisions contained in your will. Similar to TODs, bank accounts may have a pay-on-death beneficiary named. The will’s shortcomings are not limited to matters of inheritance. Generally, wills are not as well suited as trusts for putting conditions on a gift such as requiring someone to get married or divorced, or obtain a certain education level, as a prerequisite to inheriting a portion of your estate. A simple will cannot reduce estate taxes the way some kinds of trust plans can. A trust, not a will, is also necessary to arrange for care for a beneficiary who has special needs. A will cannot provide for long-term care arrangements for a loved one. However, a special needs trust can provide financial support for a disabled beneficiary, without risking government disability benefits. If you want to leave your estate to Fido, you’re out of luck in many states. Without a special pet trust, your will may not be able to provide for pets to inherit your assets. You can use your will to leave your pet to someone, and then leave money to that person in trust to help take care of your pet. A will cannot help you avoid probate. Assets left through a will generally must be transferred through a court-supervised probate proceeding, which can take months, or longer, at significant expense to your estate. If it’s probate you want to avoid, consider establishing a living trust to hold your significant assets.